Badgers fouling down 9. 2:30 left. MICHIGAN leads, 61-52, with 2:02 to go. Badgers shooting just 28% for the half. Might have something to do with it. When you can sense it. Well this got ugly quickly. Fourteen turnovers today for the #Badgers . Badgers down 11 with a minute to go. FINAL: No.8 Michigan 71, No.2 Wisconsin 56. 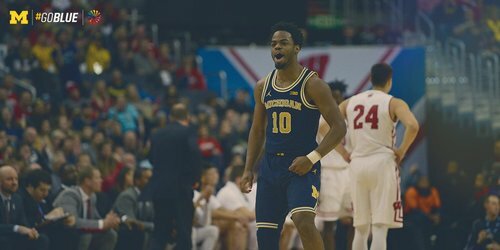 Derrick Walton caps a fantastic tournament with 22 points. Michigan shoots 56.3 percent. Final: Michigan 71, #Badgers 56. 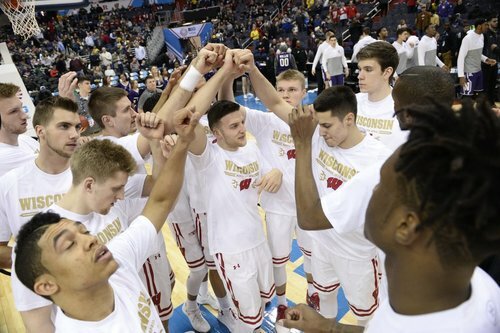 UW has to settle for second place in regular season and in the Big Ten tournament. 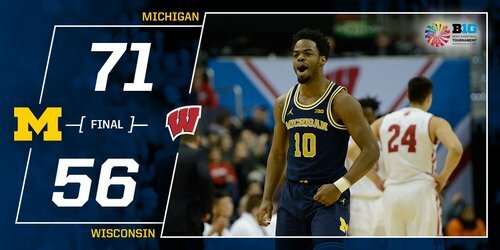 FINAL from DC: MICHIGAN WINS! A good run comes to an end in D.C.
Time to make another one in the Dance. Well then. Congrats @MaizenBrew - best of luck this weekend. Guessing that means a 6-seed - probably Sacramento, but maybe Orlando or Indy. Let's hope Indy. We'll be here thru the Selection Show. 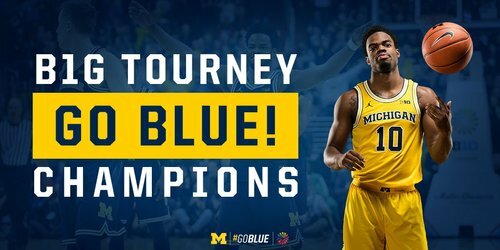 Michigan hadn’t beaten UW twice in a row since a 4-game winning streak over the Badgers that stretched over the 1997-98 and 1998-99 seasons. FINAL SCORING: Koenig 15, Happ 14, Hayes 14, Showalter 8, Brown 5. Zero bench points for UW. Badgers shoot 39.3 percent. 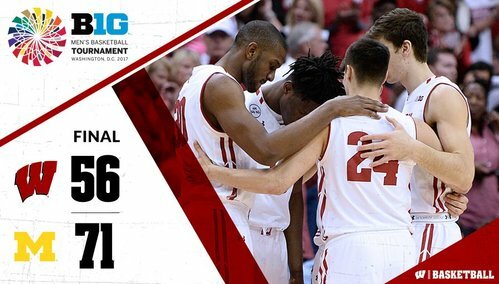 Thanks, guys, @BadgerMBB . Great game. Good luck in the Tourney. "This game we took a detour. We have to remember the first two games how we played and get that back for the next tournament." Unofficially, I had the #Badgers 5 of 16 in the paint in the second half. That, plus nine turnovers in 32 possessions, spelled disaster. 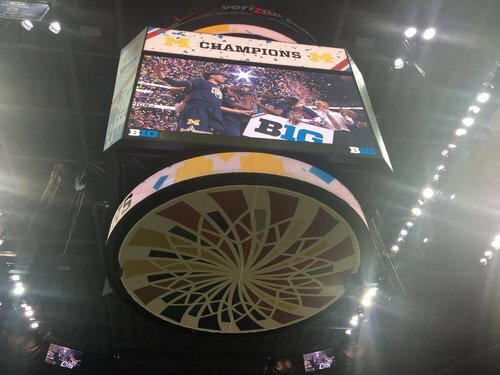 Hey @B1GMBBall : We'd like to watch the selection show in the work room while we are working. Help please. #Badgers an 8 seed vs. Virginia Tech in Buffalo on Thursday. It's Gard vs. Buzz. #Badgers No. 8 in Buffalo vs. No. 9 Va Tech (Thursday) vs. Buzz Willaims. Wow. Winner gets Nova. Wisconsin draws a No. 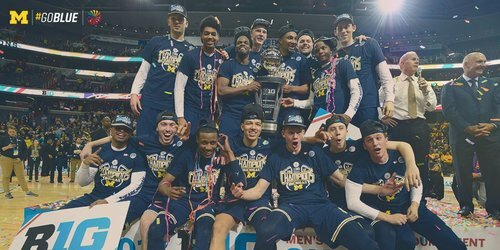 8 seed in the NCAA tournament and will face No. 9 seed Virgina Tech on Thursday in Buffalo, New York.